Mobius Strip is the seventh level in the Babylon story of Sonic Riders: Zero Gravity, comprising as it does the game's Last Story. Unlike the other levels of the game, completing three laps is not the objective of this race; rather, players have to defeat Master Core: ABIS, the game's only boss, within the time limit. The level is mostly featureless besides a few jump ramps and grindrails, and the track actually is a Möbius strip. The "lightless black" is a black hole that will engulf and destroy everything. Sonic, Jet, and friends take a final stand in order to stop it! After thwarting Eggman's MeteorTech plans at the summit of Crimson Tower, the Babylon Rogues and Team Sonic prepare to head home, their latest adventure concluded. Wave has packed up the Arks of the Cosmos, but suddenly, a charred and smoking SCR-HD smashes into the building and swipes their case! The possessed robot floats away through the air, heading towards Babylon Garden. Tails finally connects the dots about the 'lightless black' a moment too late. SCR-HD brings the Arks too close to the Garden, and BOOM! The floating city's drive containment collapses, and a black hole pops open underneath the structure. Needless to say, this does not do good things to any object nearby. The shockwave decimates Crimson Tower and the Garden itself, and the singularity looks set to consume all of Sonic's world. The heroes leap on their Extreme Gear right into the heart of the storm, in the hope of stopping the collapse before it's too late. On the revealed Astral Babylon, SCR-HD has mutated into a giant, warped monstrosity, Master Core: ABIS. 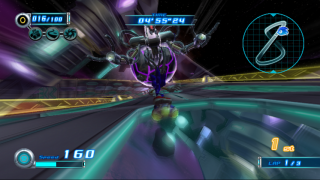 The boss prevents players from using their own gravity drive this level; instead, he activates the effect himself, and to hit him Sonic must meteor burst along the Babylonian architecture.